It's here! It's here!!! 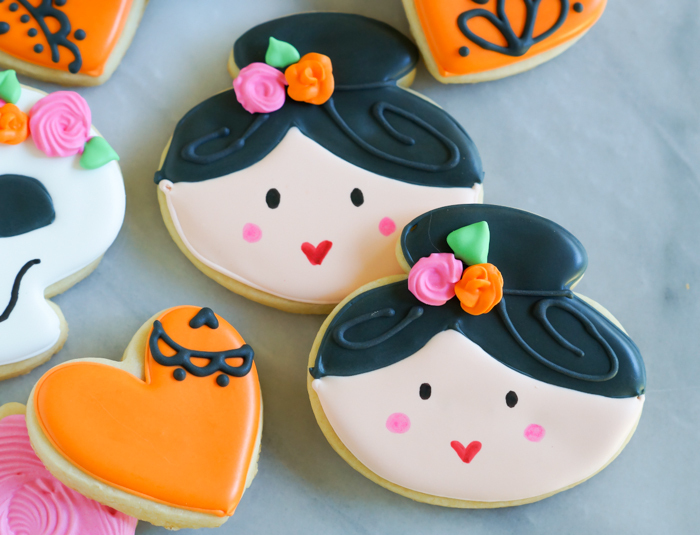 Sweet Sugarbelle's line of cookie cutters and cookie decorating tools is here! You may have seen Callye on HSN (yay, Callye! ), but her line is also now available at Michael's. SO EXCITING!!! 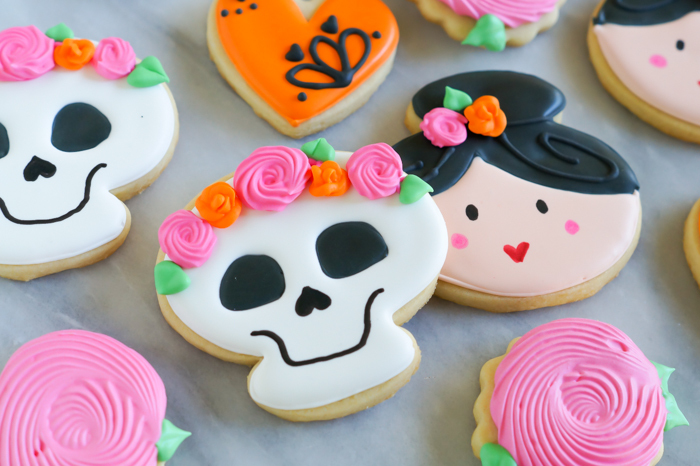 Besides the fact that Callye makes THE cutest cookies, I've always been amazed at her ability to flip a cookie cutter shape around and make something totally different. 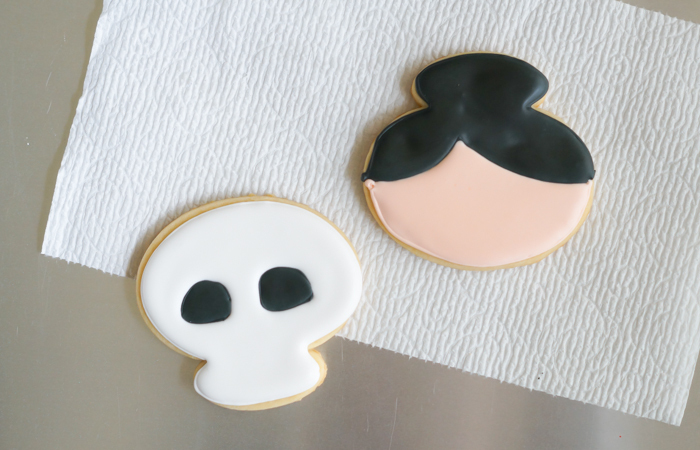 Years ago when I was writing Decorating Cookies, Callye was kind enough to let me feature her in the guest baker section, talking about just that. 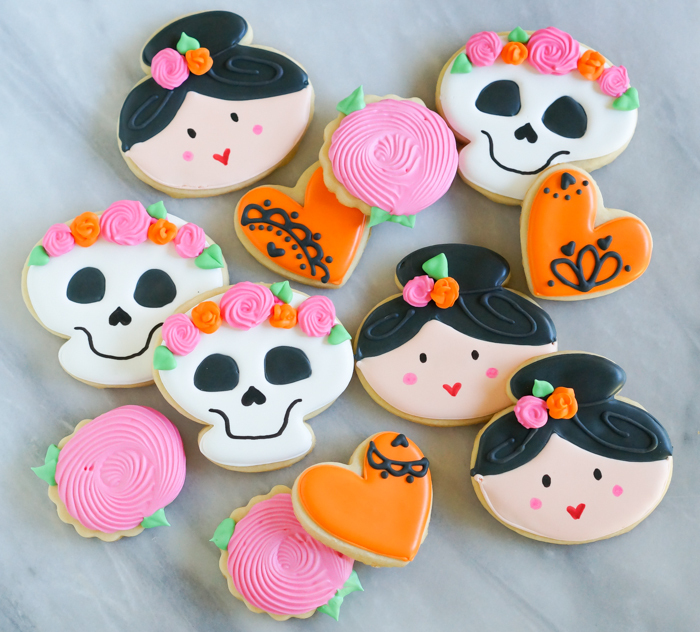 I used the Sweet Sugarbelle Shape Shifter cookie cutters to help make this set. (I'll be writing about more of the Sugarbelle products soon, so stay tuned.) 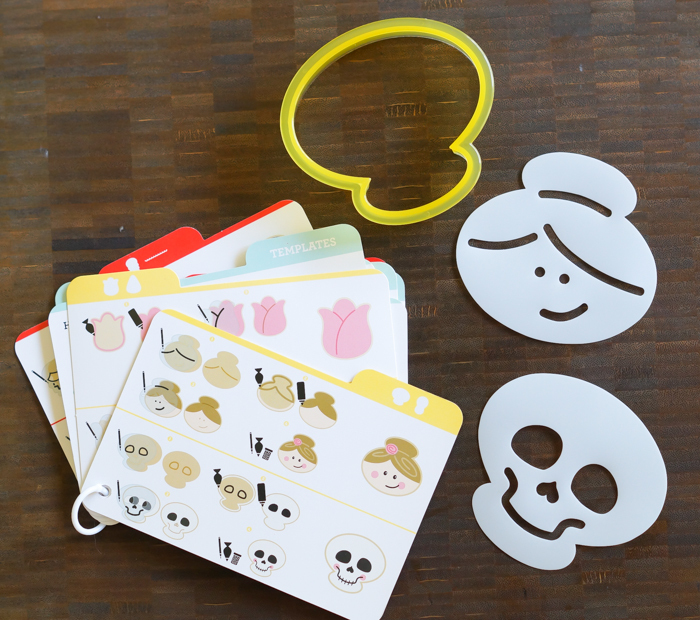 The shape shifter cookie cutters come with helpful step-by-step instruction cards as well as stencils to help guide the decorating. So smart! 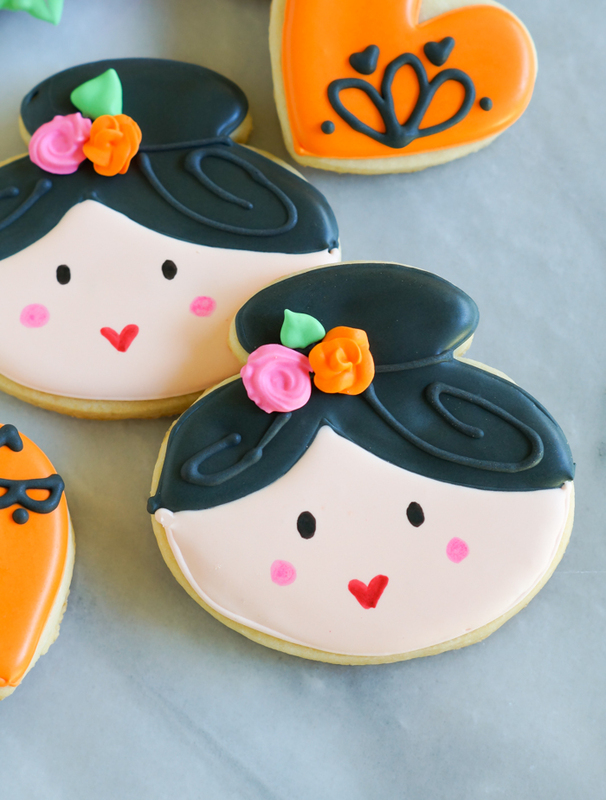 Along with the shape shifter cookie shapes, I used a scalloped circle and a heart to just add a little more to the set. See more on making the lace hearts here. And on the roses here (I used royal icing for these instead of buttercream). 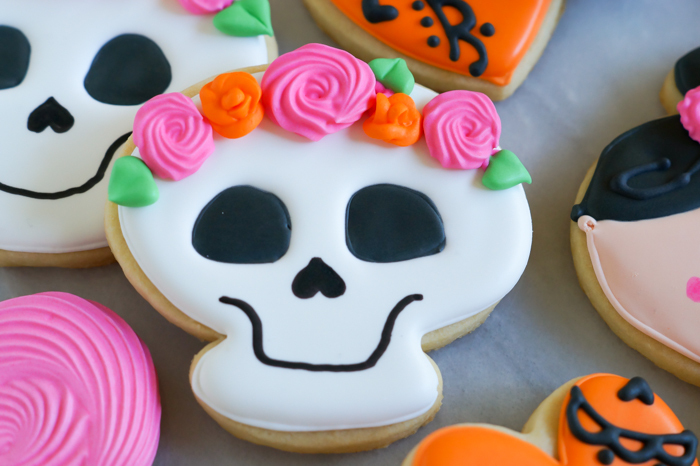 On that note, for the flowers on the girl and on the skeleton, you can either pipe those directly onto the cookies or make them ahead of time, then place them on the dried cookies with a bit of icing. That's what I did here. I used a star tip to make the pink roses and the pink are toothpick roses, detailed here. Make the cookies. 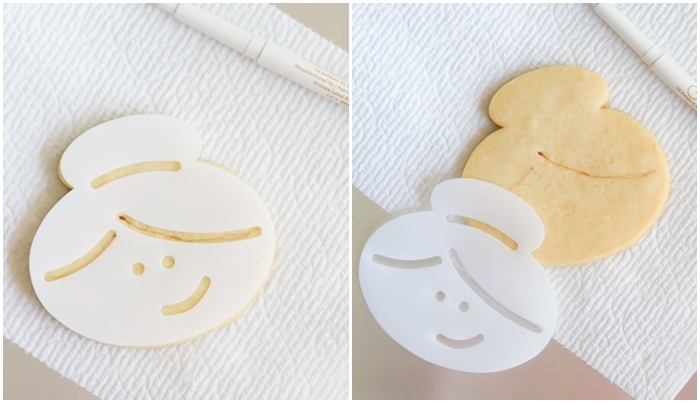 Use the Sweet Sugarbelle pen and stencil to mark lines for piping. 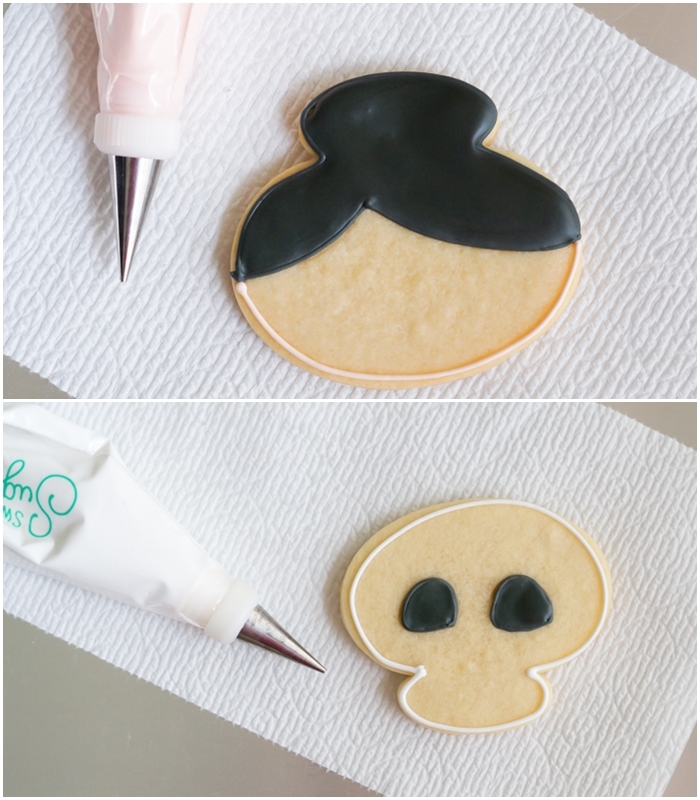 Use black icing to outline the pen lines using a #2 tip. Reserving some of the piping consistency icing, thin the black icing with water, a bit at a time, stirring with a silicone spatula, until it is the consistency of a thick syrup. You'll want to drop a "ribbon" of icing back into the bowl and have it disappear in a count of "one thousand one, one thousand two." Four is too thick, one is too thin. Count of 2-3 is good. Cover with a damp dishcloth and let sit for several minutes. Stir gently with a silicone spatula to pop and large air bubbles that have formed. Pour into a squeeze bottle. Pour into a squeeze bottle and flood the outline, using a toothpick to guide to edges and pop large air bubbles. Let the icing dry uncovered for 6-8 hours or overnight. Use a small star tip to make pink roses, a leaf tip for the leaves, and a 101s tip to make toothpick roses. Let those dry overnight as well. 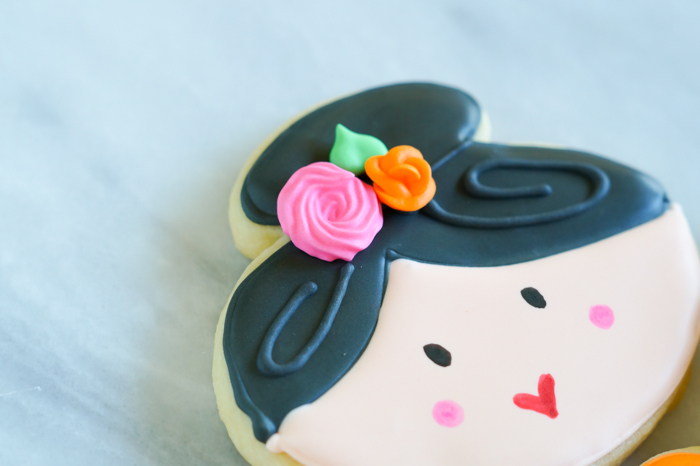 Use the black icing and #1 tip to pipe hair detail. Pipe a bit of royal icing on the back of the dried flowers and place onto skeleton to make a flower crown and on girl's hair. Let the icing set up for about an hour before packaging. I'm so excited to share more of Sweet Sugarbelle's products with you next week! Yay! But I can never make a cookie look like yours..:(---tears. What a beautiful set this is..adorable.You make flawless cookies. What can I say.... simply awesome! 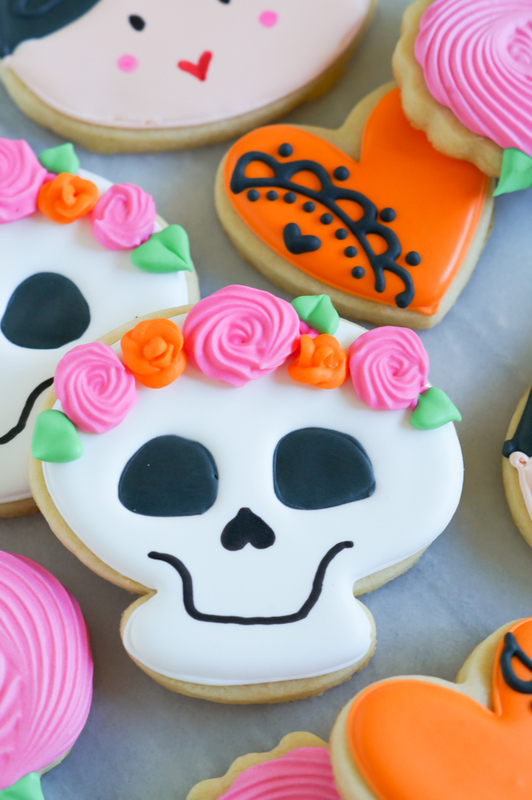 I don't like things about Halloween o "muertos" but I have to say that your cookies are the prettiest dia de muertos cookies ever! 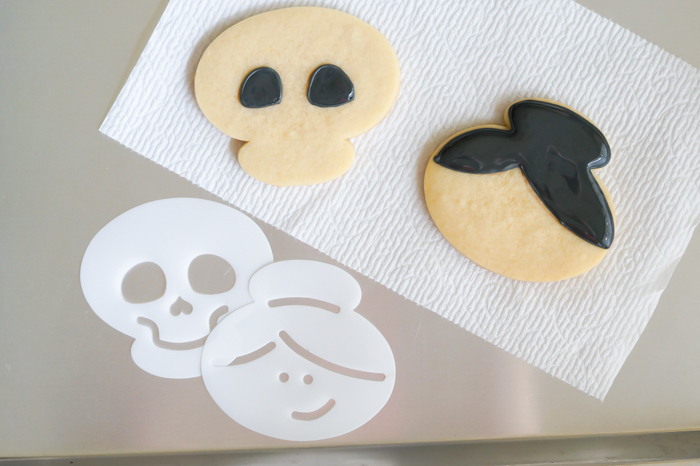 I have no patience to decorate cookies like that, you are an artist!! Heya Bridget. I know u probably meant well on these cookies, thought they'd be a fun and seasonal thing that everybody could do, but to be honest? this set up greatly upset me. im a mexican person, and i've seen too many white food bloggers take dishes from my home and childhood and "better" them by twisting them around into something they're not. and i've seen too many white people make profit off a holiday that isn't even theirs. i'd reconsider posting this, especially with the lightskinned lady cookie. 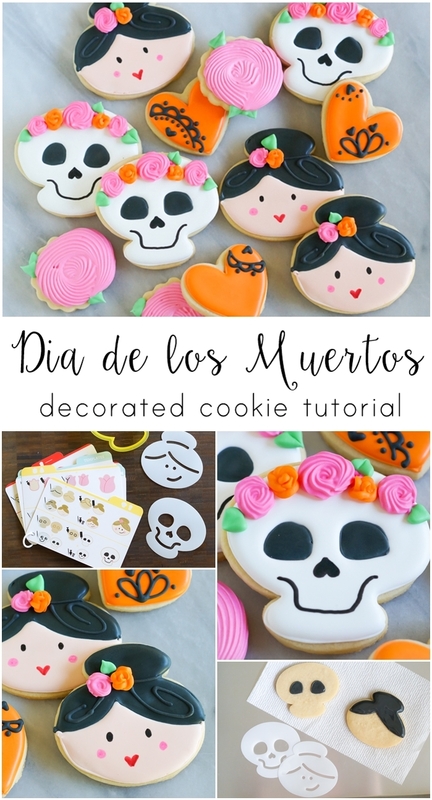 not that there aren't lightskinned mexicans, but for a holiday that is Nothing But Mexican/Latinx, it feels really iffy and incredibly uncomfy to me that the color on the lady cookie is white. we dont use pink roses on our altars, we use marigolds, which at least the skull has a touch of. plus, the calavera, or sugar skull food paint, as you're going for, isn't correct either. wish i could say im sorry if you're offended, but i'm not. p.s: plenty of ladies are present in mexican media, especially in dia de los muertos situations. ladies usually lead the parade. not that you'd know, since, you know, you're a huera. I'm of the mindset that we can celebrate all cultures...it's the way I was brought up...to be curious about other people's cultures and to embrace them.